All of Common respects all of John Legend. Just last weekend, the "All of Me" singer won a 2018 Emmy for producing Jesus Christ Superstar Live in Concert. As a result, John became a member of the super exclusive EGOT club meaning he's won an Emmy, Grammy, Oscar and Tony. While fans and family were more than excited with the news, a close friend couldn't help but express how significant the accomplishment is and was. "We text back and forth and I congratulated him. He was like, 'Yo! You were part of this journey man.' 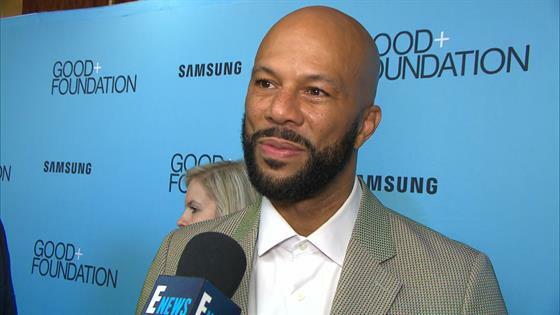 It gave me a chill," Common shared with E! News at GOOD + Foundation's "An Evening of Comedy + Music" Benefit presented by Samsung Electronics America. "Wow, I'm actually a part of the journey. Anytime you're the first black [man] to do something, that's incredible." He added, "It's incredible to see John Legend get his EGOT. That's inspiring for me. Of course I would love to join that company but I'm just continuing to try to do the best art I can do." That's not to say Common isn't thinking about how he can join the club soon. In fact, the rapper and actor is already thinking about what's next. "I could write a play or act in a play too. I want to act on Broadway. I love going to see Broadway plays," he explained to us. 'I love going to see plays in general. I've been looking for the right theater piece for me to be a part of." Shortly after John picked up his big award, E! News was able to catch up with the EGOT winner. As you likely could have guessed, he was thrilled to receive such an honor that has only been reached by a select few. "This is crazy," he shared with us. "I truly never believed that I would be getting an EGOT when I started my career. I just wanted to sing songs that people loved and maybe win some Grammys. But the Oscars, the Tonys, the Emmys—this is pretty amazing."